Concentric bends in electrical conduit refer to long-radius bends that typically match the bend radius of different size conduits to each other. Chapter 9, Table 2 of the NEC gives the minimum radius for conduit bends; this is typically the radius built into conduit benders of all sizes. It is only the minimum radius, however. 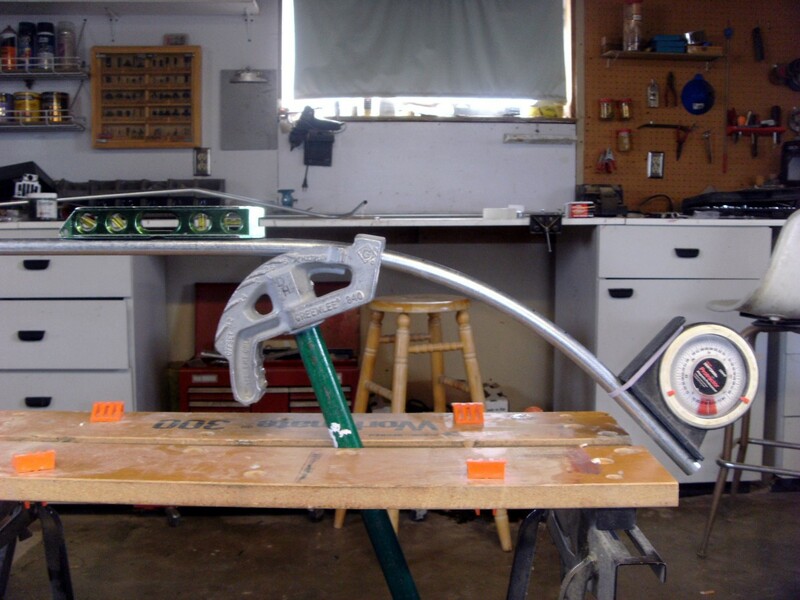 Longer radius bends are always possible, if a little time consuming to accomplish. Consider a rack of different size conduits aligned parallel with each other. When the time comes to bend the conduit (perhaps a 90° bend in each conduit) they will not align well with each other during the bend, or when the bend is completed, when the conduits all use a different bending radius. This hub is designed to give instructions on how to eliminate that visual problem by making all the conduits have the appropriate radius. Mostly a matter of appearance rather than function, many jobs still require concentric conduit bends on racks of conduit. As always, there is a little math to be considered in complex conduit bending instructions. Don't worry, though, there isn't a lot of it. For the example to be used throughout this hub, we will be using the case of a 3" conduit with a ½ conduit placed 2" away from the outside of the larger conduit and making the same 90º bend. The NEC code book, chapter 9, table 2 gives the bend radius of 3" electrical conduit as 13" and the radius of a ½" is only 4". 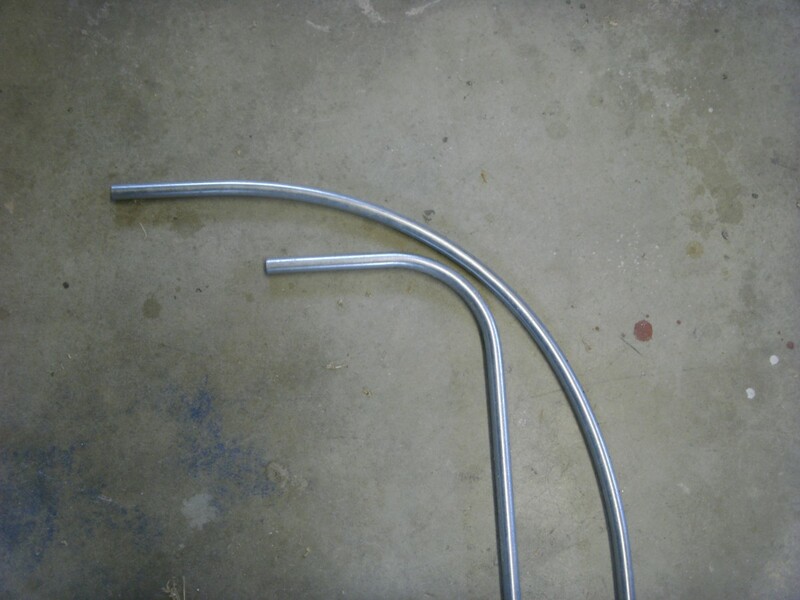 As the smaller conduit has a much smaller bending radius, when both conduits are bent to their minimum radius (that is, the normal bend from any bender) and aligned so that the bend begins at the same point the smaller conduit will have to pass through the larger one and will end up on the wrong side of the large conduit. Just picture a large conduit with a long, gentle bend and a small conduit with a much sharper bend both going in the same direction and the small conduit on the outside of the bend. The small conduit needs a much larger bending radius, but what should it be? This is probably a good time to define some math terms we will be using. 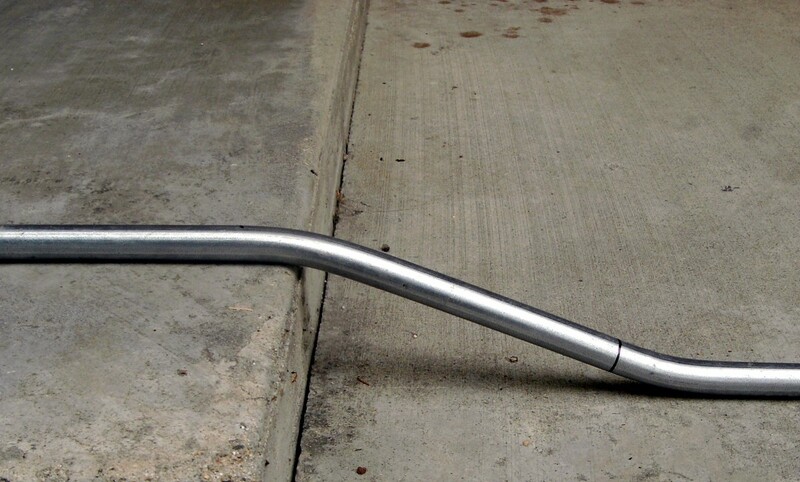 Imagine 4 pieces of conduit, all bent into a 90 and laid end to end so that they form a circle. The radius is the distance from the center of that circle to the inside of the conduit. The circumference is the distance completely around the circle formed by the inside of the conduit and is equal to the radius times 6.28 (radius*6.28). Back to our math problem. The radius of the 3" conduit is 13" (from the NEC) and the thickness of that conduit is 3". 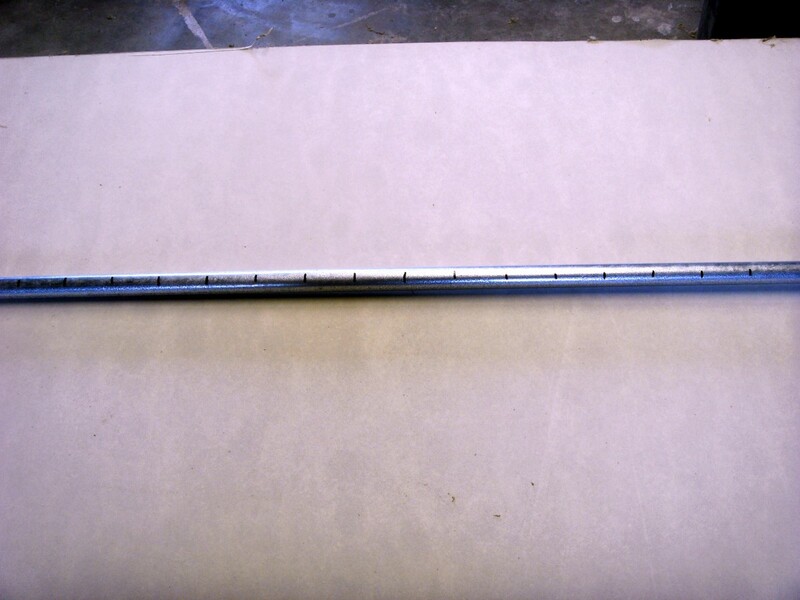 The ½" conduit is to be placed 2" away from the larger one: adding the three figures (13 + 3 + 2) gives us the needed bending radius of the ½" conduit, or 18". A concentric bend in EMT. A long-radius bend laid next to a normal 90˚ bend. Concentric bends are made by making many small bends with a small distance between them rather than one large bend. A little more math is needed to decide just how many bends will be needed and how far apart they need to be. We know the radius of our concentric bend is to be 18"; given that figure we can find out how long it should be as well. In the preceding section we found that the circumference is the distance around the imaginary circle made by 4 90º bends. The distance we need is thus ¼ of the circumference as we only have ¼ of a complete circle. The calculation is as follows: 18" * 6.28 / 4, or 28.2". If we divide that into 18, 5º bends we will have the 90º bend we need (18 * 5 = 90). Dividing 28.2" by 18 bends we see that each bend should be 1.57" apart - we'll round that off to 1.5" apart. 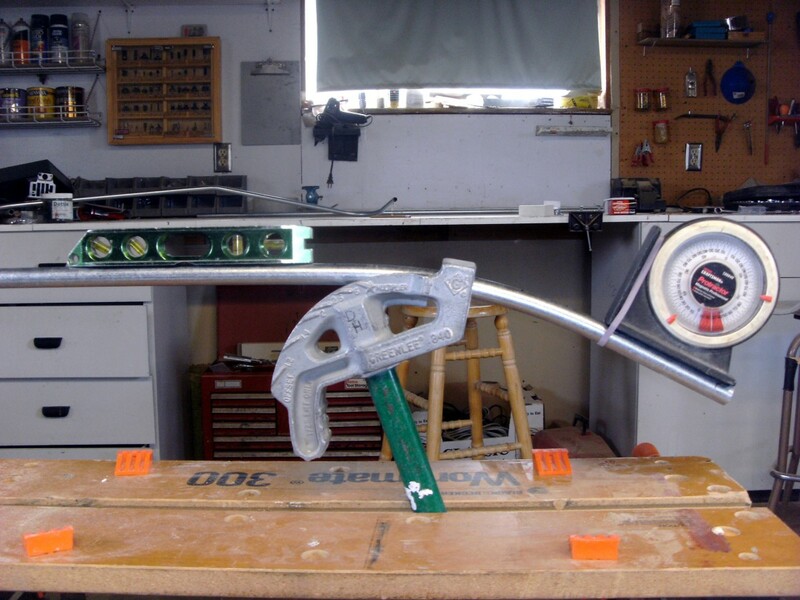 Now that's about the minimum possible using a ½" conduit bender, but the fact that we will be making only 5º bends helps. Mark the conduit with 18 marks made 1.5" apart. It is best to make the bend and then cut off the end to match existing conduit as the normal deduct figure will no longer apply. 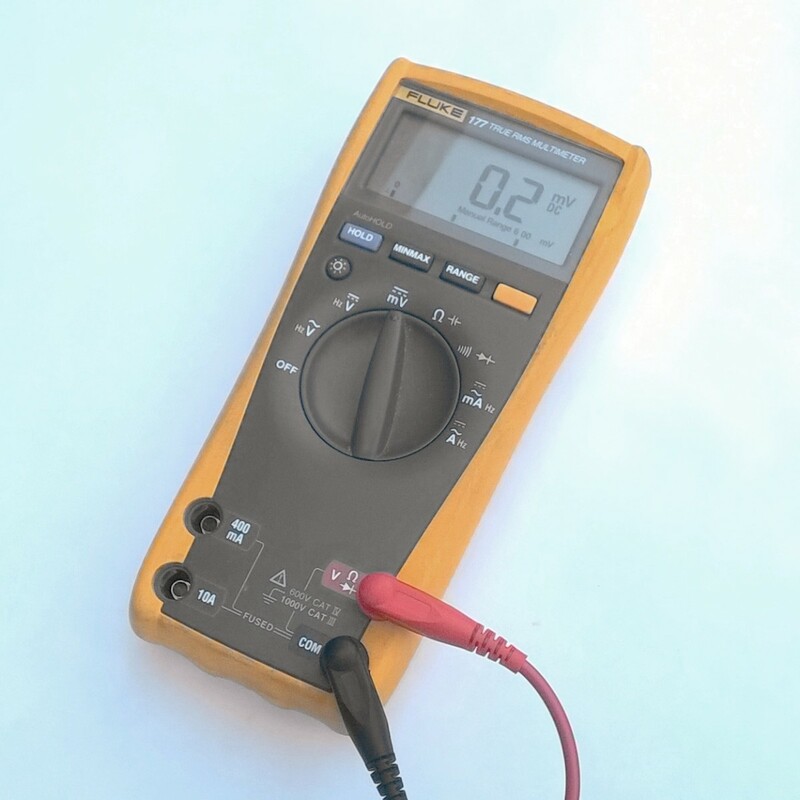 Hand benders do not have a 5º mark on them and even power benders such as the Greenlee 555 are not accurate enough to make 18 identical bends, so each bend will need to be measured with a protractor (angle finder) as it is made. As many electricians do not own this tool, I have included a link to Amazon, where several styles are available. The first bend is made and checked to be 5º, the second bend should show a total of 10º, the third should show 15º and so on. Don't try to make each bend exactly 5º but rather check the total amount of bend that has been produced each time. This is why the 555 machine will not work by itself; even a ½º error can accumulate into a 9º error over 18 bends, leaving your 90 at only 81º. 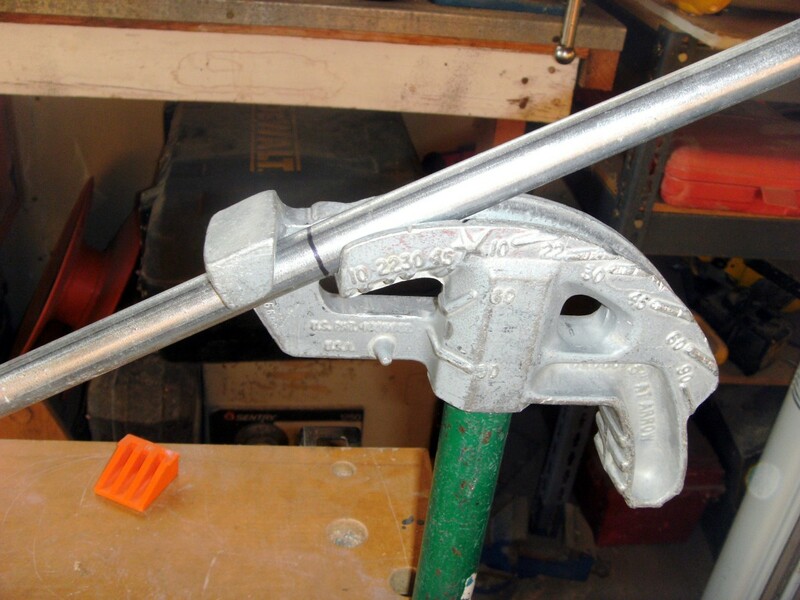 The pictures below show checks being made as more and more bend is produced - a vise was used to hold the bender and conduit for the photos but will not, of course, be used during the actual bending process. While the top example is much more inexpensive, the bottom one is more accurate and easier to read. 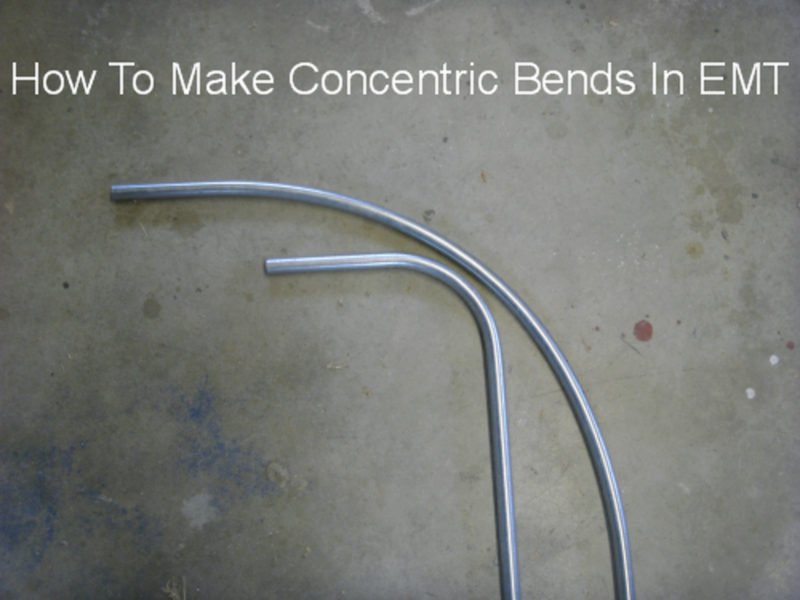 If concentric bends, or even bending larger conduit, is likely to be frequent, I suggest the more expensive option. If you expect to only use it infrequently the cheaper example is probably sufficient. 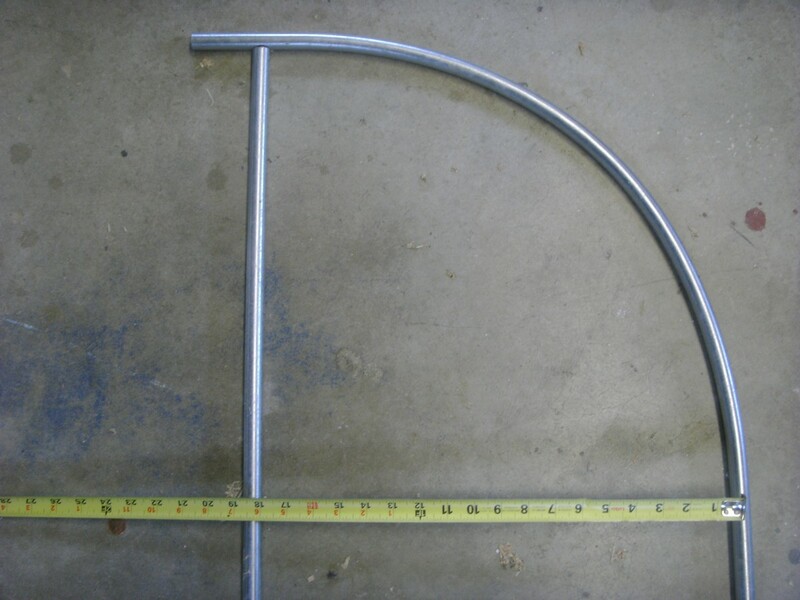 The photo below shows the completed concentric bend with another conduit laid out as a straightedge to check the radius. It is very close to the 18" desired—a successful bend. All that remains is to cut off the ends as required and fit it into place. 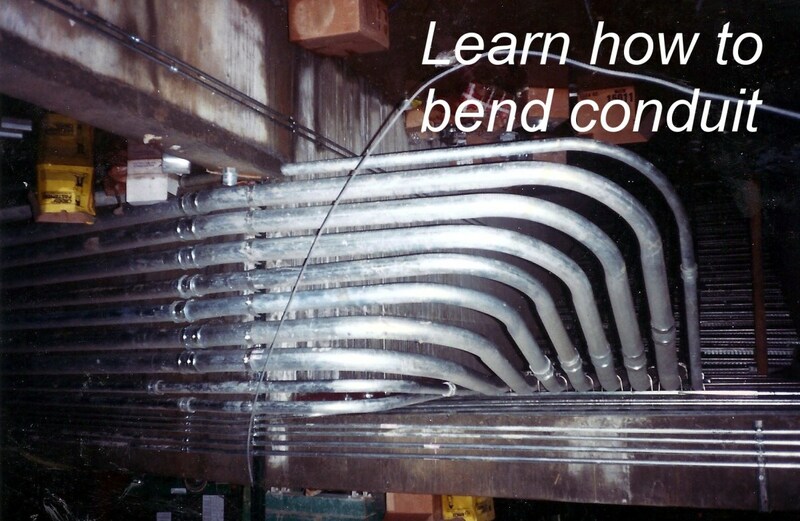 Concentric bends of small conduits with small radii are difficult to manage. We used 18 bends for the example, and a lesser number is possible, but the fewer of bends the greater degree of each bend The conduit soon comes to look odd, with a jerky appearance to the bend. Fifteen bends isn't bad, but at 9 bends it doesn't look good at all. A radius of 6" allows only 9.4" on length, and even 9 bends gives only about 1" between bends. Very long radius figures may need even more, smaller degree, bends. 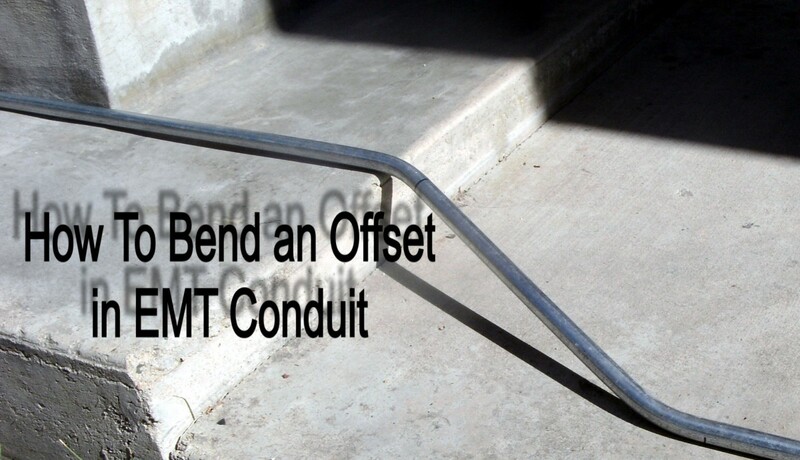 Usually the largest conduit towards the inside of the rack of bends is used as the baseline, with other conduits being bent on both the inside and outside of that baseline conduit. 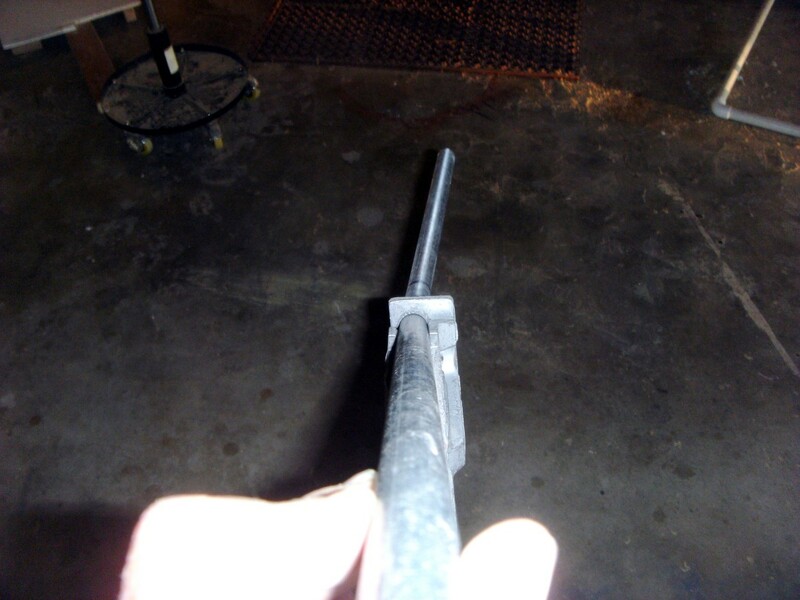 There are exceptions however; a 3½" conduit just inside a 4" conduit may require that the smaller conduit be used as the baseline and the larger conduit bent into a concentric. Conduits on the inside of the baseline are calculated by subtracting, not adding the conduit thickness and distance between conduits to find the radius. Making concentric bends is time consuming. It is quite possible that a large rack of conduits make such bends uneconomical and normal bends that take only a fraction of the time are necessary regardless of appearance. A rack of 15 or 20 pipes might take 2 or more days to complete where normal bending could be accomplished in a matter of hours. 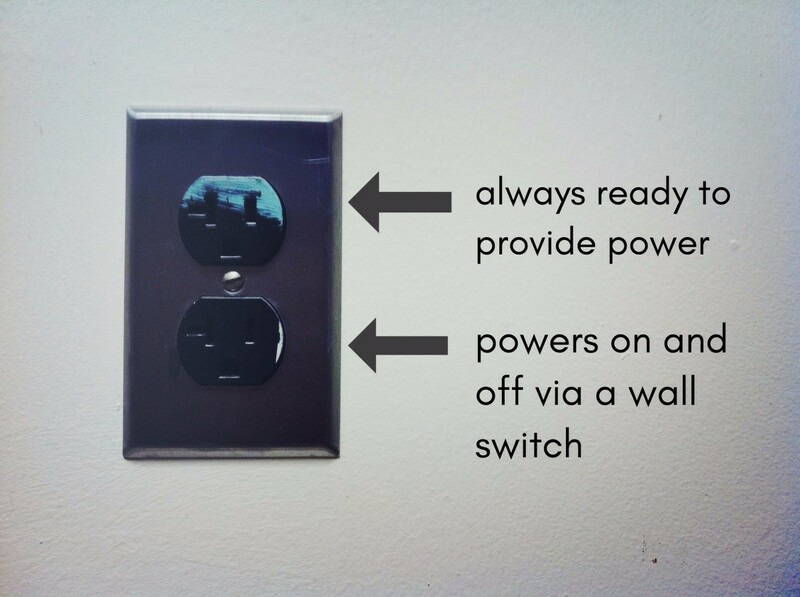 A final note: This article is but one of several written by an electrician, for electricians. 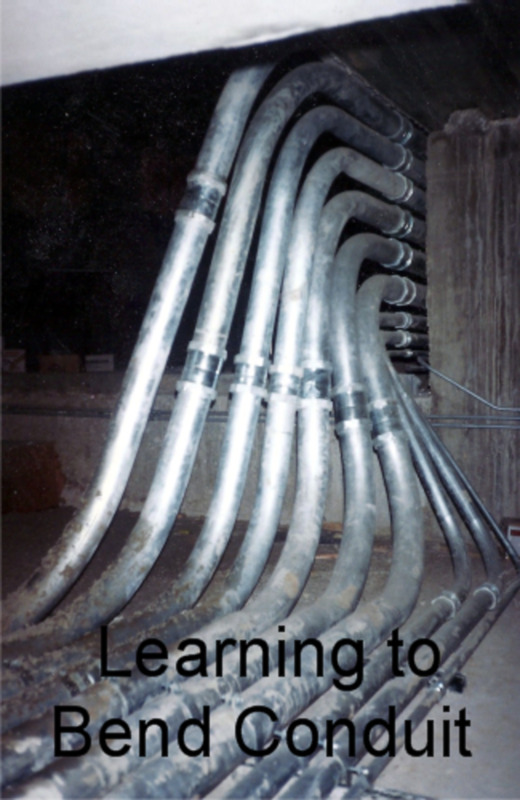 A comprehensive guide to bending conduit has been written that gives a brief description of each page, along with a link to individual pages as well as a handful of other links to pages electricians might find useful. Feel free to check out this title page for anything else that looks interesting. If you don't find what you are looking for, leave a comment and it will be considered for future pages; the whole series is, and will continue to be, a work in progress. At the beginning of your article, you determined the radius of the 1/2 emt is 18". But since the radius is measured from the center of the conduit, would not the measurements be taken from the center of the 3"? For example: 13+(1/2 diameter of base 3" emt) 1 1\2" + (spacing) 2" +(1/2 diameter of 1/2" emt). No. The radius produced by a bender is applied to the inside of the bend, not the center of the pipe. The surface of the bender is, for most benders, the minimum radius allowed, and this translates into the circle made by the inside of the pipe, not the center of the pipe. I’m bending a 1 1/2 alum. Conduit around a tank. The tanks have platforms sticking out about 4 feet. So I have build supports off that platform. My question is how do I put that into account when I’m trying to calculate my bend around the structure? Unless the conduit is moving towards and away from the tank at every support, add the radius of the tank to the 4 feet that sticks out at your supports. This is the radius of the bend. I assume it will be very large. If I'm understanding correctly it isn't really a matter of concentric bends, but of either a single or multiple pipes all at the same large radius. I really appreciate your valuable info on this subject thank you for taking the time to share. I'm not sure what you refer to. There is a deduct for a regular 90 degree bend (not a concentric) and it must be deducted, not added. if that is what you refer to.